Dale Gilbert Jarvis: Fan email for "Haunted Ground" - and some ghostly drummers! Fan email for "Haunted Ground" - and some ghostly drummers! It is official: Haunted Ground: Ghost Stories from the Rock is now in stores, and people have been picking it up and already sending me feedback, which I love. 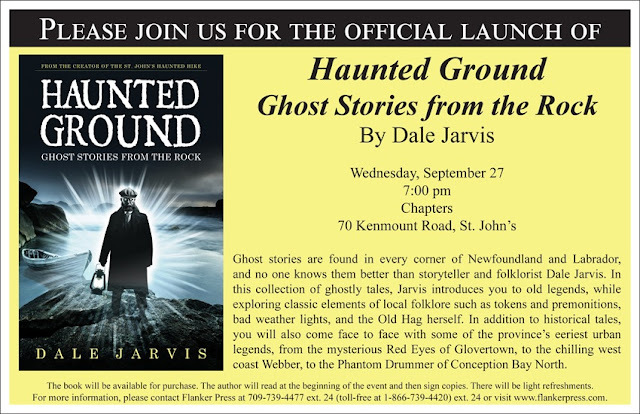 The book includes a section on contemporary and historical legends, including modern urban legends like the Webber of Western Newfoundland, and Glovertown's creepy Red Eyes. It also has a discussion of one of my favourite Newfoundland legends, the tale of the Phantom Drummer of Conception Bay North, who appears in a couple different incarnations in communities along the Baccalieu Trail. Hi Dale. So I picked up a copy of Haunted Ground today. After reading the synopsis on the back, I was drawn to the story "the phantom drummer of conception bay". You see, I grew up in Kelligrews, CBS, I'd like to say about 20 years ago while I was a young teen, my family experienced something that to this day we cannot explain. A family of 5 (along with our pet dog) were startled (in fact myself and the dog were woken from our sleep) by a noise that we can only associate to loud drummers almost like a marching band (the symbols were there too!) marching down our street in the middle of the night. When my father hesitantly looked out the window, nobody was out there but we could still hear it. The next day my father asked our neighbours about this, nobody else heard it and it was brushed off. Why did an entire family along with their dog, hear this and nobody else seemed to? Could it have been related to this drummer?!!! 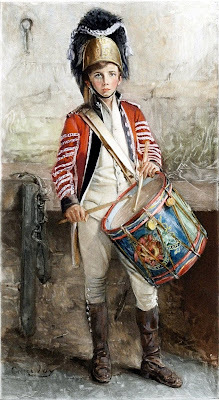 Thought I'd just pass it along as I just finished that chapter in your novel and to this day have never heard of another story with drummers. Also, I'd like to say thanks for this great read! The writer went on to say, "I spoke with my oldest brother last evening about this and said I forgot to mention that this 'group' were chanting as well. He vividly remembers them saying 'don't shout, don't cry out' over and over and this lasted for a couple of minutes." Do you know a Phantom Drummer story from your community? Email me at dale@dalejarvis.ca. Or, come say hi at the Haunted Ground book launch, happening September 27th, at 7pm, at Chapters in St. John's! I'll be there to tell a few stories, and sign your books!